HTAT Exam Answer Key officially released. Candidates who attempted the examination can check their answers with HTAT 2015 Provisional Answer Key 2015. 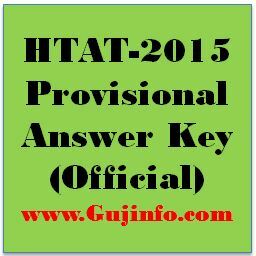 Aspirants can download the HTAT Answer Key form official site gujarat-education.gov.in/seb/ for all question paper. Head Teacher Aptitude Test (HTAT) is the Gujarat level competitive examination. Gujarat State Examination Board, Gujarat conducted HTAT exam every year. Nearly 44000 candidates applied for this year. This year HTAT 2015 exam was held on 20 September 2015 Sunday at various center. After closed exam they all candidates keep waiting for HTAT Provisional Answer Key. The official Answer Key now availabe to download in the official site or direct link provided below.